"A follow-up to the riotous Pretend I'm Dead, this is what a sequel should be: darker, sexier, funnier. By turns nutty and forlorn... Brash, deadpan, and achingly troubled, Mona emerges as that problematic friend you’re nonetheless always thrilled to see." "A thoroughly delightfully, surprisingly profound encore. Beagin stands out among fiction’s fresh crop of promising voices: Her prose is dry, cutting, and genuinely funny; she loves writing about strange people, an affection which translates in characterizations that stay sharp and peculiar without ever turning cruel... Vacuum proves dramatically satisfying too, as Beagin pushes its boundaries to grant us deeper, darker access into Mona’s interior life, and the pain of her troubled past. The character’s salty perspective resonates perfectly — a kind, weary, almost laconic wit that carries a sneaky depth." "A wildly exuberant novel that doesn't shy away from the weirder and more disgusting parts of life. Vacuum in the Dark is a funny and surprisingly sweet book about a young woman who grew up too fast and is trying desperately to reinvent herself... Beagin is a wonderfully funny writer who also happens to tackle serious subjects, which few authors are able to pull off successfully... the result is a comic novel that's a joy to read but never frivolous or superficial. Beagin is unafraid to take risks, and they all pay off here — Vacuum in the Dark is an excellent book by a writer with a singular voice." "Energetic... These adventures open up into larger questions of Mona’s own stalled artistic ambitions and a reckoning with her estranged mother—issues refracted with black humor and a sense of timing that rarely slackens... The escapades are underpinned by a strong voice that seems to have seen everyone’s worst, and to have nothing left to conceal." "Piquantly amusing... Weird, darkly funny... sharply drawn, sexually charged, wry with Mona’s deadpan wit." "Revels in both order and transgression... Stands alone beautifully... Mona’s unforgettably wry voice remains throughout." "Tremendously engaging... Funny and poignant... Beagin excels at mixing comedy and pathos in a way that dilutes neither... Beagin secures her position as a new writer to watch. "Sharp and superb... Beagin pulls no punches--this novel is viciously smart and morbidly funny." "Inventing situations and conversations that are off-the-charts in both weirdness and relatability, Beagin fashions an enchantingly intriguing main character in unfiltered, warmhearted Mona. This story of a woman embracing life's what-ifs and her own darkness is a great read." "Beagin introduces readers to several recurring characters whose quirkiness infuses the book with its humor and drawing power." "Alternately warm, sharp, and deeply wise... Scathingly funny." "Vacuum in the Dark is wacky, wicked and funny on the surface but roiling below with danger and deep seriousness. Beagin’s writing style is breezy and light, and Mona is delightful and witty. This makes for enjoyable reading but ensures that the punches the book packs are hard-driving and always on target. Mona is refreshingly honest and heartbreakingly hurt. Beagin allows her protagonist to be strange and charming, sexual and smart, even as she forces Mona to confront pain, loss and uncertainty. This is a very good, original and human-hearted novel." "Rib-ticklingly funny-sad... [Beagin] works magic in the space between hilarity and heartbreak... Absurdly affecting." "Pretend I'm Dead by Jen Beagin is like one of those old-fashioned classics by Charles Bukowski or John Fante or, more recently, Denis Johnson, a shambling, lyrical dispatch from the dive bars and the flop houses where the downtrodden, divested of hope, livelihood, good health, and any number of other markers of respectability, nevertheless retain full possession of their hearts and minds, their integrity, their souls, too, perhaps--and no one nearly as triumphantly as Mona Boyle, Beagin's heart-breaking hero & alter-ego. Rare is the encounter with such a frank and unflinching voice reporting from life on the edge, and rarer still the humor and compassion that Beagin manages to locate in some of the country's, and the psyche's, darkest corners. This book invaded my dreams, took over my conversation, and otherwise seduced me totally." "Jen Beagin has one of the freshest voices I've read in years - funny, wise, whip-smart and compassionate. I tore through Pretend I'm Dead with a deep sense of affection for all of its beautifully flawed characters and their bittersweet lives." "Pretend I’m Dead is funny, weird, disturbing, and just a touch magical. Mona, our main character, is such fabulous company, even when she wants everyone in her life to leave her alone. Jen Beagin’s novel will stare you down, mesmerize you, and dare you to laugh." 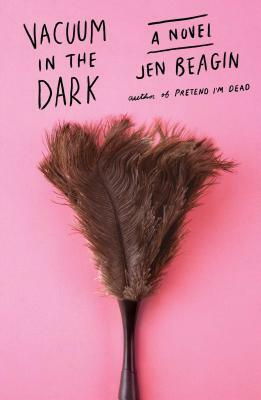 "With her droll humor and hilarious (but also earnest) observations, the 24-year-old narrator of Pretend I’m Dead had us hooked from page one. Mona gets by cleaning houses; in her free time, she hands out clean needles to heroin junkies. She is adrift; a dreamer without the fuel to make her dreams real. Pretend I’m Dead follows Mona as she moves to a new city, through a few relationships. But reciting the plot doesn’t do the book justice. Glide through Mona’s series of bad decisions with her – she’s a good companion." "Beagin's work has been compared to Denis Johnson, which is high praise indeed, and totally deserved based on this smart, funny, darkly profound debut."